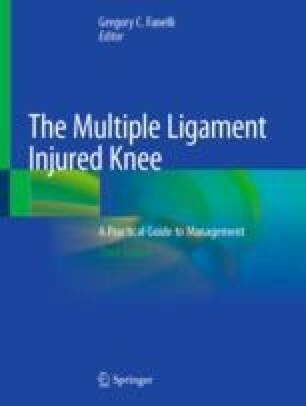 The multiple-ligament injured knee is a complex environment of three-dimensional instability. In many cases, conventional techniques suffice for restoring function and decreasing pain in this patient population. However, in cases of extreme instability, high energy trauma, high demand patients, or revision, conventional reconstruction techniques may be insufficient. An emerging technique, commonly referred to as “internal bracing” or “suture tape augmentation,” has great potential to improve stability and restore function in these cases. In this chapter, we will explore the historical roots of this technique. We will then discuss the biomechanical theory and available clinical data. Finally, we will present two case examples and describe the senior author’s preferred surgical technique. Burnett QM, Fowler PJ. Reconstruction of the anterior cruciate ligament: historical overview. Orthop Clin North Am [Internet]. 1985;16(1):143–57. Available from: http://www.ncbi.nlm.nih.gov/pubmed/3881714. James SL, Kellam JF, Slocum DB, Larsen RL. The proplast prosthetic ligament stent as a replacement for the cruciate ligaments of the knee. Aktuelle Probl Chir Orthop [Internet]. 1983;26:116–20. Available from: http://www.ncbi.nlm.nih.gov/pubmed/6136221. Ahlfeld SK, Larson RL, Collins HR. Anterior cruciate reconstruction in the chronically unstable knee using an expanded polytetrafluoroethylene (PTFE) prosthetic ligament. Am J Sports Med [Internet]. 1987;15(4):326–30. Available from: http://www.ncbi.nlm.nih.gov/pubmed/3661813. Mascarenhas R, MacDonald PB. Anterior cruciate ligament reconstruction: a look at prosthetics–past, present and possible future. Mcgill J Med [Internet]. 2008 Jan;11(1):29–37. Available from: http://www.ncbi.nlm.nih.gov/pmc/articles/PMC2322926/pdf/mjm11_1p29.pdf. Kennedy JC. Application of prosthetics to anterior cruciate ligament reconstruction and repair. Clin Orthop Relat Res [Internet]. 1983;172:125–8. Available from: http://www.ncbi.nlm.nih.gov/pubmed/6821978. Najibi S, Banglmeier R, Matta J, Tannast M. Material properties of common suture materials in orthopaedic surgery. Iowa Orthop J [Internet]. 2010;30:84–8. Available from: http://www.ncbi.nlm.nih.gov/pubmed/21045977. van Eck CF, Limpisvasti O, ElAttrache NS. Is there a role for internal bracing and repair of the anterior cruciate ligament? A systematic literature review. Am J Sports Med [Internet]. 2017:36354651771795. Available from: http://journals.sagepub.com/doi/10.1177/0363546517717956. Eggli S, Röder C, Perler G, Henle P. Five year results of the first ten ACL patients treated with dynamic intraligamentary stabilisation. BMC Musculoskelet Disord [Internet]. 2016;17(1):105. Available from: http://bmcmusculoskeletdisord.biomedcentral.com/articles/10.1186/s12891-016-0961-7. Henle P, Röder C, Perler G, Heitkemper S, Eggli S. Dynamic intraligamentary stabilization (DIS) for treatment of acute anterior cruciate ligament ruptures: case series experience of the first three years. BMC Musculoskelet Disord [Internet]. 2015;16(1):27. Available from: http://bmcmusculoskeletdisord.biomedcentral.com/articles/10.1186/s12891-015-0484-7.